On the right is Asashouryuu, the "bad boy" of sumo, who was the sole Yokozuna (top rank) for some time, but who has been banned for the last couple of competitions. On the left is Hakuho, who has won in Asa's absence, and as a result was also promoted to Yokozuna. And you thought it was just two fat men trying to give each other wedgies. How many policemen does it take to apprehend a lone suspect? - that is, if the policemen are Japanese and their target is suspected of the heinous crime of assaulting a police officer. Japanprobe has a video of the aftermath. Actually, on reading the fine details, they did not actually apprehend the man at all, he simply crashed his car into a bridge support. Meanwhile, a 15yo schoolgirl in Saitama did more for crime prevention with one well-aimed kick than a battalion of Osaka's finest could manage. My tax yen at work...still, when they are doing this, they aren't harrassing people for cycling while gaijin. Can you say "survivor bias"? There's a (presumably unintentionally) funny report on Nature's "Peer-to-Peer" blog today. Entitled "Researchers like the peer-review system", it discusses a study in which "more than 3,000 senior authors, reviewers and editors were asked about the peer-review system". Surprise surprise, they basically liked it (although with some reservations). For an example of what I mean by "survivor bias", drawn directly from Peer-to-Peer's previous posting(! ), I'd bet dollars to doughnuts that the "more than 3,000 senior authors, reviewers and editors" did not include many of the women who find that they have a much tougher time publishing as first author. Because of course as a result of this gender discrimination, they are less likely to be "senior". One could hardly expect those who have benefited most through the system, to admit that their success is substantially a matter of luck and nepotism, whether or not this is the case. (By "nepotism", I mean that if you want "entry" to the top journals, having a famous supervisor to co-author your papers is very helpful.) One might as well ask sitting British MPs if they support the constituency-based simple majority electoral system that effectively guarantees many of them a job for life (actually, they do). My ears pricked up when I noticed that the respondents were reported as being hostile to "open peer review". However, on checking the summary, they use this term to mean signed reviews, and it is unrelated to the open system of many EGU journals that I have mentioned before. [Note that I'm intentionally not saying what I think about the peer review system here. That's not my point. In fact I've had no real problems with peer-review myself, until I started to tread on the toes of some "probabilistic climate prediction experts" at which point my work became simultaneously (1) well-known, (2) interesting and important, and (3) wrong-headed - and most importantly, (4) not appropriate for this journal. But that is a separate rant you've all heard many times. Indeed overall I probably just about qualify as one of those "senior authors" who supports the system pretty much as it is]. I've mentioned the scary state of the Japanese legal system before. Here's another lovely story of an obvious stitch-up, where a foreign resident was locked up for a few days on nothing more than the word of a deranged taxi-driver. And it's not over yet, he faces the possibility of a year in prison (more likely, he'll have to pay a few million yen in "compensation", which may be what the taxi-driver was planning in the first place, only he seems too mad to have had a plan). Arbitrary detention without basic legal rights (such as access to a lawyer) is the sort of thing I expect of tin-pot 3rd-world dictatorships, not a supposedly modern liberal democracy (well one out of three ain't bad). We had our own run-in with a mad driver several years ago. He tried to drive his large truck straight through the middle of our tandem (turning left on setting off at a traffic-light controlled junction). In response to a slap on the wing-mirror from jules (which nudged it out of position, but fortunately did no damage) he went ballistic. Fortunately the police calmed everything down and just made us all apologise to each other. If I'd known then the risk I was taking, I might have made more effort to escape before they arrived. "Declines in Tokyo stock prices do not mirror Japan's economic health, senior government officials said Monday after the key Nikkei stock index lost more than 3% from late last week. 'Current stock prices are mainly due to speculative moves by foreign investors,' Takao Kitabata, vice minister of economy, trade and industry, told reporters. 'I do not believe the prices are reflecting the Japanese economy's actual strength.'" Kitabata, the top bureaucrat at the ministry, said he believes the slump is running in tandem with a recent rise in the value of the Japanese currency, which has created an environment encouraging foreign investors to take profits on the Japanese stocks they hold. Maybe I've been watching too much "Yes Minister". But maybe I'm right to be suspicious. Funny how these things come in a bunch. I've already posted about these vague proposals JT about revamping the visa requirements for Japan, including language skills testing. Now a similar sort of idea has popped up again, but there's still no sign that anyone has actually thought it through. Before anyone jumps to the wrong conclusion, let me say at the outset that of course it is not unreasonable to impose some sort of language requirement on permanent residents and citizenship applications. These people are (in principle) here to stay as members of Japanese society. There already are de facto requirements, if not exactly de jure, in the form of paperwork and a face to face interview (no interpreter allowed!). Exceptions are only made for mass murderers on the Interpol wanted list (eg), and I don't want to stay here that badly. It's not really clear what is being considered - there is no such thing as a "long term visa" anyway, with most categories limited to 3y. And obviously it would be a complete non-starter to hope that foreign professionals or wannabe English language teachers would take Japanese lessons just on the off chance that they might get offered a short contract here at some point in the future. So I am still waiting with interest to see what concrete proposals, if any, actually see the light of day. As P. Lewis has noted in the comments to this post, we are now half-way through the month of January, so it's time to check up on how Piers' forecast is coming along. His original prediction was for a rather cold month, with a mean temperature of "0.8C at best" (matching 1987), which would make it one of the coldest 6 Januaries in the past 100 years. Central England Temperature (the classic long time series) can be found here, and here (courtesy of P. Lewis again) is an interesting site which while unofficial, claims to track CET pretty well. So far (at the time of writing) CET over the first half month is 5.92C, a full 1.72C above the 30-year mean (they use '71-'00). The historical data shows a standard deviation for January of about 1.8C, meaning that the temperature is running at 1sd above the mean, and poor Piers was forecasting it to be 2sd below. You can't get much more wrong than that. Of course, we could be in for a couple of weeks of -6C (average) temperatures, which would save his prediction. But the 5-day forecast is for more mild weather, so I agree with my correspondent that +6C or higher over the month is looking like a rather more plausible outcome. That would put it in the top 10, rather than bottom 6, Januaries in the past 100 years. It's a question I'm occasionally asked. Well, more often, it's a sort of disbelieving "you can't really read Japanese, can you?" when I have deciphered something as complex as the sign outside a toilet (hint for visitors: men are typically blue and have trousers, women are pink and have a skirt). OK, I can do a little better than that. But I certainly can't read a Japanese newspaper, because it's got far too many kanji I don't know. However, Mr X (whose name I actually know, but he wants to remain anonymous) is rather more capable than me. In principle, he could read a newspaper...were it not for the minor detail that his local newspaper company refuses to sell to foreigners! As you can see from the comments on that post, this is not even a one-off that could be put down to a bizarre accident, but has happened to other people with other newspapers. I suppose it's possible that the newspaper companies are so embarrassed at the xenophobic nonsense and toadying to the Establishment that they print that they don't want the outside world to see it (I've remarked before on how the English translations presented on their web sites sometimes diverge markedly from the original text provided to the natives). But on balance it seems more likely that this is just another symptom of the unthinking exclusionism that is rife in Japanese society. Call me a cultural imperialist if you want, but there's got to be something seriously screwed up about a country where their concept of "human rights" means that arbitrarily refusing to sell to a foreigner is A-OK, but sticking up a poster in a train advertising a traditional festival, which happens to show a bit of chest hair, is considered "sexual harassment". For the record, Japanese trains are routinely plastered with pictures of juvenile "swimsuit models" in pouting poses. I wonder what the dirty old men who run Japan would think if a few women (or even schoolchildren or their parents) said they didn't want to see that? "The [Japanese] government will aim for 30 percent of all households to have solar panels installed by 2030"
That's 40 million people. Japan is already one of the world-leaders in this area, at about 1% household coverage. 30% is a lot. Japan is blessed with a lot of sun, but is otherwise short of energy resources. Their nuclear power industry is large but the climate for that isn't great, so the country is heavily reliant on imported oil and likely to remain so for some time. We are also right at the limit of generation capacity here, with official Govt advice (eg on air-con use) aimed at cutting peak demand in the summer. So obviously promoting solar power could brings substantial benefits both in energy security, and avoiding new power station construction. Of course the massive cash injection into research will also cement Japan's position as the world's leading producer. I'm not sure if I've written it before, but I've long thought that one of the best reasons for increased investment in renewable technology is to get at the forefront of the technological advances. It hardly takes a genius to see which way the wind is blowing on this in the medium term. IMO spinning this policy as primarily a global-warming issue is probably as much political convenience as hard reality. The Japanese happily pay massively inflated food prices on the grounds of food security (probably that's got a lot to do with buying the support of the agricultural sector), so it is hard to see them objecting at support for energy security too, if it was presented in those terms. But doing something about emissions certainly makes you one of the "good guys" internationally. Either way, I hope it's the sort of action that people at all positions in the spectrum can agree is a good thing. OK, maybe hard-line libertarians could argue that the Govt spending taxpayers' money is less efficient than the private sector doing it by themselves. But compared to (say) wasting trillions of dollars on an unwinnable war in the Middle East in the vain hope of securing a couple more decades of affordable oil, it's hard to argue that the Japanese approach to energy policy is worse! Would you bet on the satellite record? There's been a few amusing goings-on in the blogosphere recently. First, Chip Knappenberger commented on an old post, to point out that the satellite temperature record had actually shown a negative trend over the last decade (albeit not a "significant" one, and only if he switched his allegiance to the RSS data in contrast to UAH). So although he would have lost his bet, it was quite close. As I commented in reply, it was a bit of a surprise to me that it ended up so close - but a loss is still a loss. WCR has also blogged it here. Then Roger Pielke Jnr got in on the act, wondering whether the RSS observations posed a problem to climate science. First he thought that the lack of warming was a problem for model predictions, and then that the apparent discrepancy between surface obs (which are in line with the models) and satellite analysis was a problem for those who thought that this had all been sorted out. 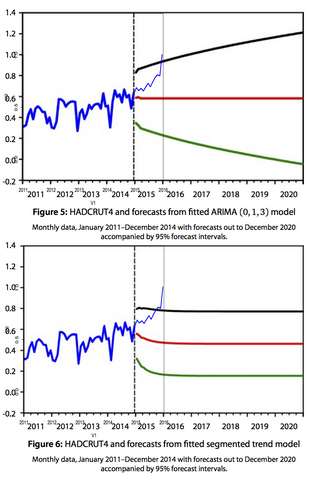 Interesting to see again, another example where another apparent anomaly between models and hot-off-the-press data is being resolved in favour of the models. There is a lesson there for those who care to learn it...and those who do not, will no doubt repeat history in the near future. Of course I'm setting myself up here for a fall - maybe the "cooling" data will turn out to be right after all. Wanna bet? "Killer drivers could avoid jail"
So says the BBC. And this is supposed to be news? Killer drivers in the UK routinely avoid any sort of significant penalty at all, especially if they "merely" run over a few cyclists. For a particularly extreme case of driving far too fast for the conditions (icy road) in an unfit vehicle and thus killing no fewer than 4 people, a 180 quid fine (and that was for the bald tyres, of course) is just par for the course...(don't take any notice of the Daily Wail headline, they are written by idiots, all sound and fury, signifying nothing - the police announced it was all just an "accident" before they'd even bothered to check whether the car was fit for the road). Meanwhile ex-Tory MP hacks peddle hateful vitriol in the gutter press about how cyclists should be garotted. Oh, that was funny, so the victims of these vicious and cowardly attacks shouldn't really mind. One thing I really like about Japan is that in 6 years here I have encountered less hostility, impatience and aggression than I would expect in a typical week in the UK. It's nothing to do with Japanese drivers being skilled or well-trained (they are neither), just that they are prepared to treat people outside their vehicle as if they are also human. more severe than this one. "this one" referred to an existing storm that he described as having "damaging winds and exceptionally heavy seas"
Update of Forecast of Storm activity during the period Dec 23rd/24th to 25th/26th . The current situation is interesting and present forecast maps (noon 24 Dec) are not yet showing developments which are likely to occur. the Christmas storm is likely to be more severe and potentially more damaging –particularly to Western parts of Britain (and Europe) - than anything experienced this November / December so far or since the storms of 1987 or 1990. The Christmas storm also coincides with full moon high tides on 24th December hence sea defences will be threatened. Storm activity in the Atlantic and the Western British Isles is expected build up from the West from 19th December and become significantly more ferocious and then pass through Britain during the period 23rd/24th to 25th/26th . Tornado activity is likely – probably in the South, and storm tide surges likely eg on the South coast and Bristol Channel and/or France – threatening sea defences. Top winds on land or coast in the 65mph- 95mph are likely, with higher winds associated with Storm 11 or Hurricane force 12 at sea. Winds will be damaging, travel will be disrupted and power lines are likely to be bought down in places so it may be advisable for some in exposed parts to cook early for Christmas. The Christmas storm will be followed after a lull by another stormy system attacking from the West just before the New Year. The Great Christmas storm is likely to bring colder air from the North later so Piers Corbyn and associates with WeatherAction have staked £500 with William Hill for snow on Christmas day in parts of Scotland. I see that he is now talking about -17C temperatures in January, perhaps in the hope that this will distract people from remembering what he was saying just a few days ago. freezing - 0.8C (33.4F) at best. I look forward to seeing how that one pans out. Well Piers has sent out a rambling grumble that the press have over-hyped his prediction for January. Apparently he didn't say it was going to be one of the coldest Januaries in the past 100 years, he merely said it was going to be one of the coldest 6 Januaries in the past 100 years. Of course he has my full sympathies over this dreadful misrepresentation. It must be awful to have the press turn your words round to mean something so completely different... Their report of his actual temperature prediction above stands unchallenged. And finally, Piers has helpfully told us that January will probably have a spell of bitingly cold Easterly winds. I'll top that with my own personal prediction that January 2018 will also have such a spell...anyone want to bet? As I've mentioned before, the Japanese New Year is centred on mochi roulette with a spot of kamikaze mountaineering. This year was no exception, sadly. Actually, most people laze around for a week eating and drinking too much, but that is too mundane to blog about. Much of the motivation for the winter mountaineering seems to be the desire to see the first sunrise of the year from a summit (and best of all, from the top of Fuji) but we don't have the necessary genetic inheritance for that particular foible and settled on visiting a mountain called Hinode (sunrise). It's the thought that counts, after all. We didn't even go on the first, but waited until yesterday. We did get up before sunrise if that helps. 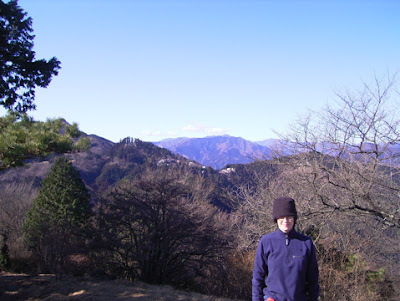 Behind jules, the neighbouring mountain of Mitake-san has a little village on top. It has a shrine, hotels, shops and restaurants, some roads and even a fire station. Curious thing is...the road does not connect down to the bottom of the valley, so presumably all the vehicles are carried up and down on the cable car! Needless to say, we walked, and earned our reward of a soak in the onsen near the train station at the end. Curiously, just like two years ago when we met a dog right at the start of the year of the dog, we saw some rats at the start of the year of the rat. I'd better leave before the year of the dragon!